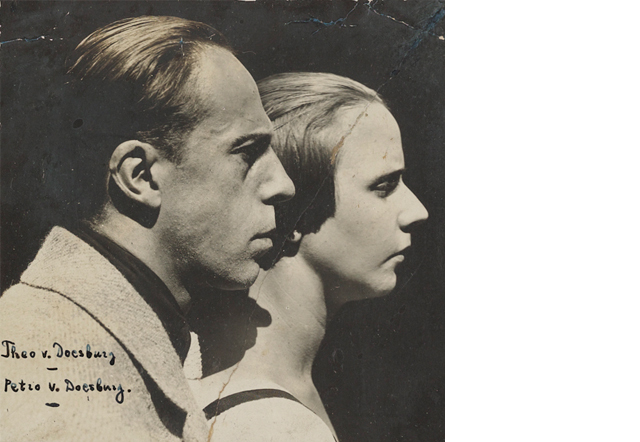 Theo van Doesburg (1883-1931) and Nelly van Moorsel (1899-1975) met in the summer of 1920, at the Art Circle of The Hague where Van Doesburg was giving a lecture. Six months later, Nelly, aged 21, broke with her family to embark on the adventure with Theo, 16 years her senior. Van Doesburg, as a painter, writer, ethicist, typographer and designer, had become the pivot of the European avant-garde. 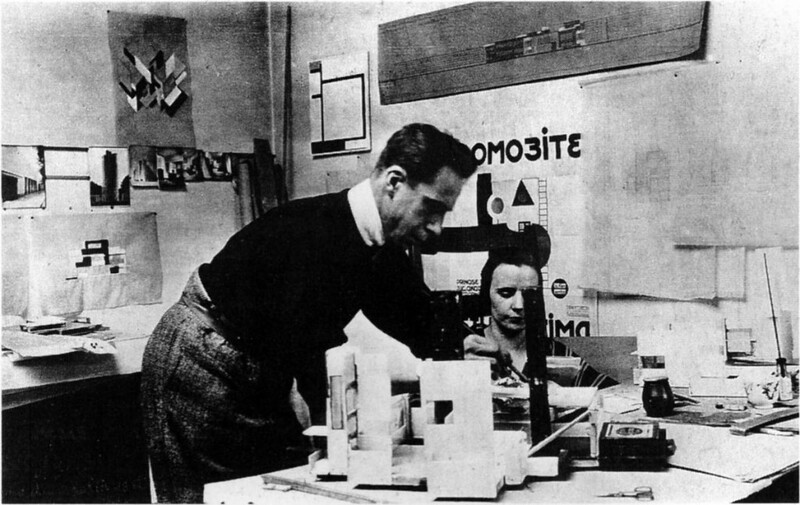 As the founder of De Stijl (1917-1931) and, as editor-in-chief of the magazine of the same name, he was invited for lectures and appearances in the Netherlands and abroad. Since their trip to Weimar in 1921 Nelly had been accompanying him on his travels abroad, where they performed a ‘double act’. 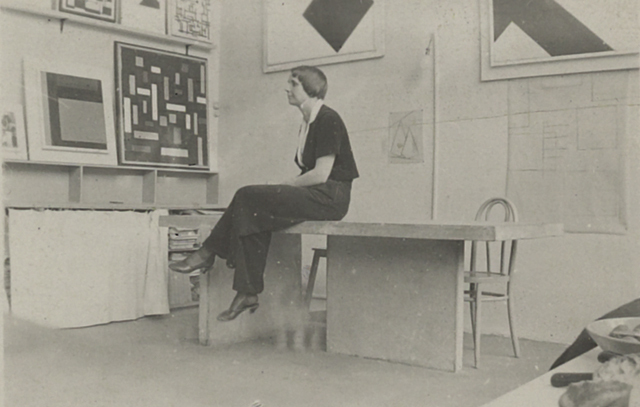 Nelly, who had studied music at the conservatoire of The Hague, accompanied Theo on the piano under her stage name, Pétro van Doesburg. Following a Dada tour through Germany, where Nelly was declared the ‘indispensable Dadaist musical instrument of Europe’, Van Doesburg organized the celebrated Dada soirées in the Netherlands. Together with Nelly, De Stijl associate Vilmosz Huzàr and the German Dadaist Kurt Schwitters (who, from the audience, would interrupt Van Doesburg’s dissertations with poetry and animal sounds) attracted capacity audiences. 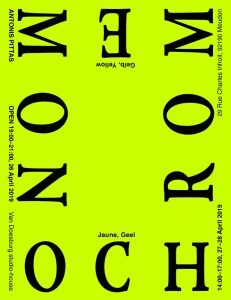 K. Schippers wrote the splendid publication Holland Dada about this Dadaist crusade. 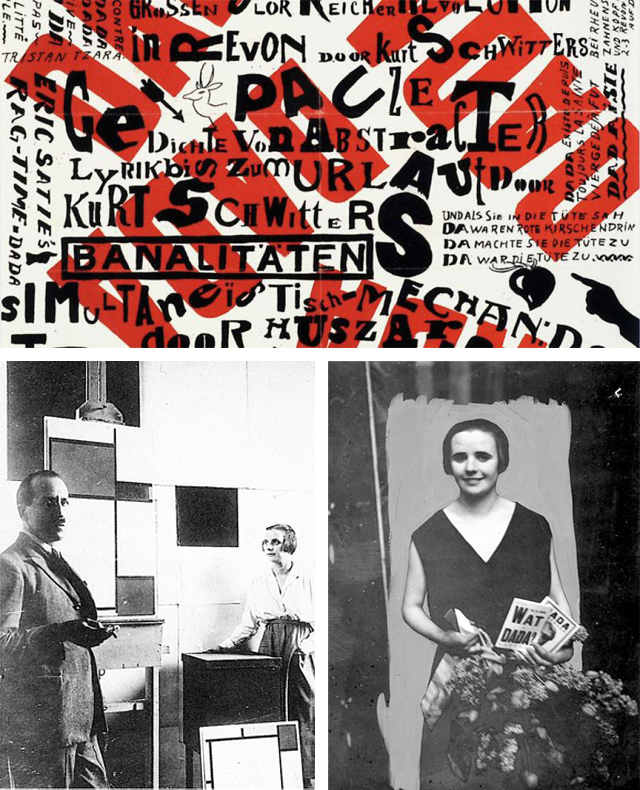 On top: program Dada Soirée, design Theo van Doesburg,1922. Below: Nelly at the studio of Mondriaan in Paris, 1923 and during a Dada evening in Amsterdam, 1923. 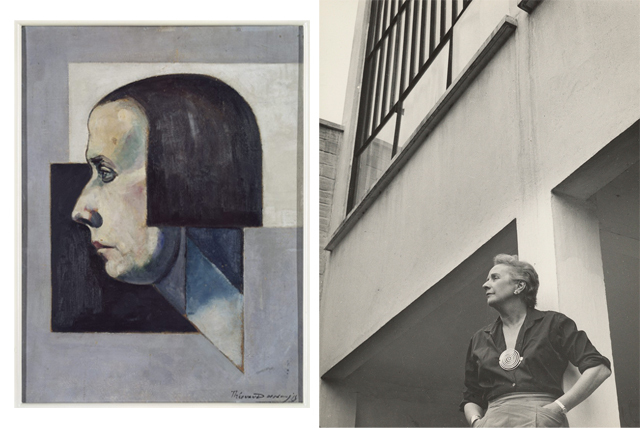 After they had lived in Weimar for a number of years, where Van Doesburg was meant to teach at the Bauhaus, Theo and Nelly finally settled in Paris. They stayed with Piet Mondrian for the first few weeks, but soon found simple accommodation at Rue du Moulin Vert. Encouraged by the collector Léonce Rosenberg, who wanted to organize an exhibition featuring De Stijl group at his Galerie de L’Effort Moderne, Van Doesburg began elaborating his ideas on ‘visual architecture’. He worked with the recently qualified Dutch architect Cornelis van Eesteren on models highlighting spatial dynamism (the fourth dimension) by way of form and colour. One way with which he expressed this was with models and colour studies for two show homes which they created specially for the exhibition: La Maison Particulière [Private House] and La Maison d’Artiste [Artist’s House]. Van Doesburg called them ‘counter-constructions’: sketched, coloured analyses of load-bearing and dividing planes in which his pursuit for non-hierarchical architecture – devoid of ornament, with no distinction between front and back, top and bottom – coalesces. The exhibition was to have follow-ups, in Nancy and in Weimar, thus establishing the international fame of De Stijl as an architectural movement. Theo and Nelly working on the model of La Maison Particuliere, Paris, 1923. The design for La Maison d’Artiste is of interest with respect to Van Doesburg’s studio-house, since it would appear to apply to the Van Doesburgs’ personal situation. The studio-house comprises several cube-like spaces which spiral round the stairwell in such a way that there are no distinct storeys. The functions of the various spaces are indicated on the floor plans: studio, chambre d’amis [guest room] and a separate music room (for Nelly). The model has a copper core; the wall surfaces are in wood, cardboard and glass. The colours for the design, or counter-construction, can be interpreted from sketches and a gouache that Van Doesburg applied as floating planes in primary colours. Shortly after that exhibition, the dream of a studio-house in Paris came closer thanks to an inheritance when Nelly’s father died. La Maison d’Artiste served as a guideline, but the floating volumes and projecting spaces impeded the realization of this design (see also ‘design and construction’). 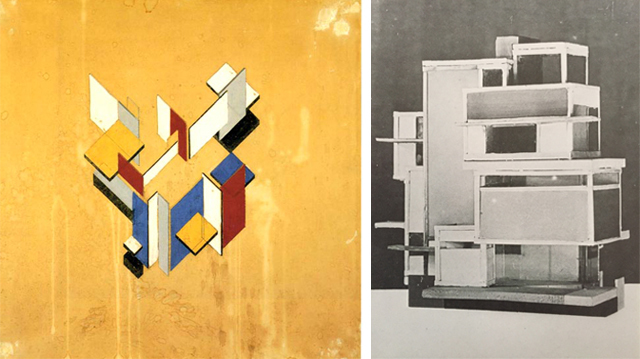 Contra-constructie, Theo van Doesburg, 1923, and model La Maison d’Artiste, Theo van Doesburg in collaboration with Cornelis van Eesteren, 1923. Before the inheritance materialized itself, Theo and Nelly moved house several times in Paris, but because they could not afford much rent, they had to make do. An assignment which Van Doesburg hoped would follow the Rosenburg exhibition did not take place and Nelly’s attempts to give piano lessons and recitals foundered. To earn some income Nelly decided to take dance classes in order to perform at some of the many dance halls in Paris. When the inheritance was released in 1924, they decided to use it to purchase a plot of land where they could build a studio-house (see also ‘design and construction’). Dancer Kamares at Theo and Nelly’s studio in Clamart, 1925 and Nelly and Theo at the studio of Piet Mondriaan, 1921. 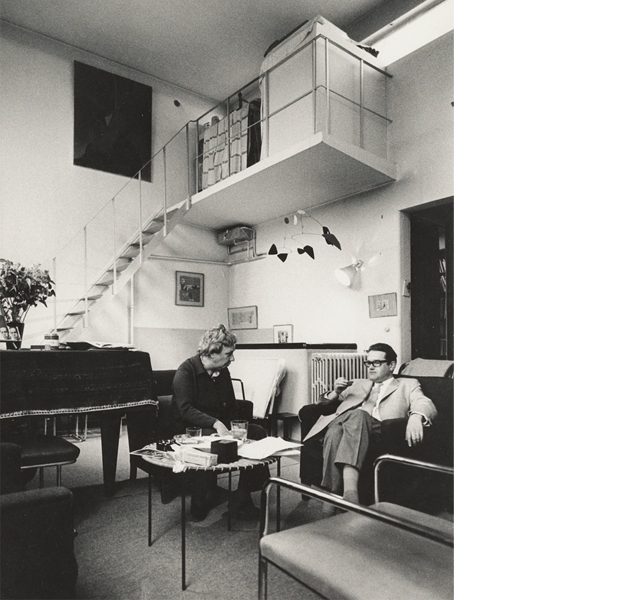 The move to the studio-house in Meudon-Val-Fleury took place in December 1930 when the house was almost finished. Theo’s asthma attacks were getting worse and they took the doctor’s advice and went to Davos, where Theo died on 7 March 1931. Nelly returned alone and lived in the house until her death in 1975. There she received her contacts from the art world and, in keeping with Van Doesburg’s philosophy, created a pilgrimage centre for artists, architects, curators, composers and collectors. Nelly considered it her mission to call attention to the legacy of Van Doesburg, not only in Paris but also in the Netherlands. In 1936 the first retrospective exhibition of his work was held in Amsterdam’s Stedelijk Museum. Two years later Nelly provided a major contribution to the celebrated ‘Abstracte Kunst’ exhibition, also in the Stedelijk Museum, where work by Piet Mondrian, Constantin Brancusi, Hans Arp, Fernand Léger and many other artists from the Modern Movement was on show. On top: Theo at the front door, and Theo and Nelly with friends on the roof terrace, autumn 1929. Below: Nelly in the studio, spring 1931. In that period Nelly became acquainted with the American art collector, Peggy Guggenheim, who became a lifelong friend. Together with Marcel Duchamp Nelly became one of her permanent advisers. She introduced Peggy into the Parisian art scene and accompanied her on her travels to the south of France, where Peggy wanted to set up an artists’ colony. Artists with a small allowance could live and work there in exchange for artworks. The plans fell through and when German troops began advancing on Paris in the early 1940s, Peggy left for America with what, by then, was an impressive collection of Cubism, Expressionism, De Stijl, Futurism and Surrealism. In 1947 Nelly visited Peggy in New York when she organized the first exhibition in Peggy’s gallery featuring Van Doesburg’s abstract work. Then Nelly accompanied the exhibition, which was shown in Los Angeles, San Francisco, Seattle, Chicago, Cincinnati and Cambridge Mass., thus establishing Van Doesburg’s renown in America. 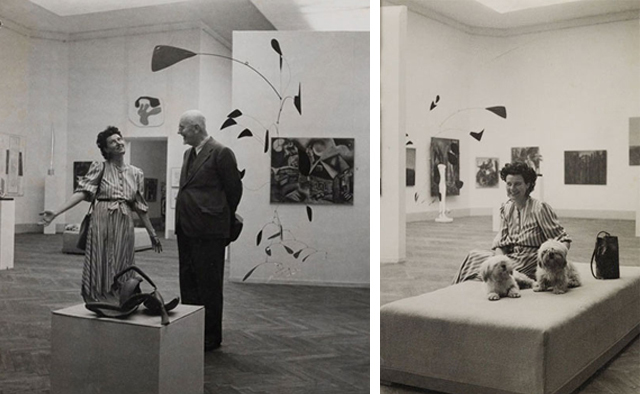 Peggy Guggenheim and Lionello Venturi in her pavilion at the Biennial in Venice, 1948. Nelly continued until her death to seek recognition for Van Doesburg. Wies van Moorsel describes that mission extensively in her biography of Nelly De doorsnee is mij niet genoeg [The average is not enough for me]. She asserts that, after Van Doesburg died, Nelly set herself that task. She also believed that far more effort was required to promulgate abstract art. Nelly returned to America several times in the 1950s to sell work by Van Doesburg, for instance to the Guggenheim and to private collectors like Herbert Rothschild. Wies van Moorsel gathered from the available correspondence that in America Nelly also often acted as a go-between for work by Piet Mondrian, Max Ernst and Fernand Léger, among others. Nelly portrayed by Theo van Doesburg, around 1922 and Nelly at the back of the house, year unknown. In the Netherlands, in the fifties and sixties, interest in Van Doesburg and De Stijl was also growing. The Stedelijk Museum in Amsterdam organized a major De Stijl exhibition in 1951 and later got involved through the curator Ad Petersen in the reprint of the De Stijl magazine. The Gemeentemuseum in The Hague also embarked on a meticulously compiled De Stijl collection, particularly while Louis Wijssenbeek was the director. In the Van Abbemuseum in Eindhoven, under Jean Leering’s directorship, a big retrospective of Van Doesburg’s oeuvre was organized in 1968. At the opening Nelly received the Sikkens prize, posthumously awarded to Van Doesburg ‘for his pioneering work for a synthesis of colour and architecture, both in practice and in writing’. Six years later Nelly van Moorsel passed away at the age of 76. Nelly and Jean Leering in the studio, 1970, photo Ad Petersen.